The Eye of the Story is a challenging title. Miss Welty is concerned throughout this book with fiction, with fictions, and with how the process of writing turns truth into a novel or story. Analysis travels backwards, she says, but the writer works into the open. She makes the engaging assumption that her readers are as interested and knowledgeable about these problems as she is herself, and that they too will be glad when a story works, when an author succeeds. "Jane Austen loved high spirits, she had them herself, and she always rejoiced in the young." Of Ross Macdonald's The Underground Man: "what gives me special satisfaction about it is that no one but a good writer -- this good writer -- could possibly have brought it off." Other enthusiasms are Faulkner, Elizabeth Bowen, Isak Dinesen, and, from many years back, S.J. Perelman. Miss Welty can be tart, as when she judges Arthur Mizener's book on Ford Maddox Ford inadequate--because Ford deserved a better book. The last, purely personel section includes her introduction to a cookbook of Jackson recipes and the preface to a collection of her own Mississippi photographs, One Time, One Place, as well as several vignettes of local scenes. In "Some Notes on River Country," we see "the little chain of lost towns between Vicksburg and Natchez" where "the houses merge into a shaggy fringe at the foot of the bluff." In the childhood memoir "The Little Store" she tells us: "I believed the Little Store to be a center of the outside world, and hence of happiness--as I believed what I found in the Crackerjack box to be a genuine prize, which was as simply as I believed in the Golden Fleece." 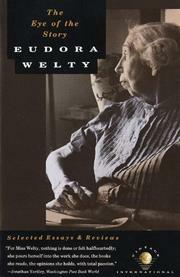 These pieces clarify Eudora Welty's presence: in life, as in her writings, she is self-possessed but never self-absorbed.